I've finally made the switch on one of my working, production mode, computers. The switch from KDE 3.x to 4.2.2 (I think - whatever Kubuntu comes with). I must admit having been sceptical to all the hype about plasma here, plasma there. Social desktop? I want my old workstation look and feel - I thought. I absolutely love KDE 4. There is so much new, but everything that is different feels intuit. My very favorite feature is, this far, the device notifying plasmoid. Not having to show the desktop to mount, open or unmount my USB-stick is just - smart and intuit. I like a lot the device notifier as well. 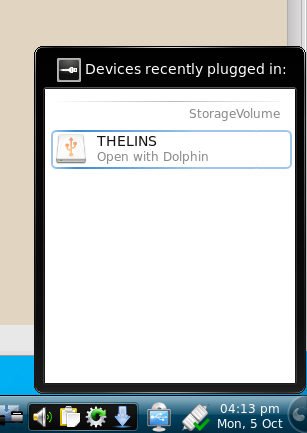 But I use digiKam so I got the pop-up window to ask everytime with what application I want to open the storage device. Then I looked the kde-look.org site and I found this what has more features than the default ones. Including automount. I think there are instructions on how to update on the Kubuntu home page. Until then, just leave everything untouched on your OS. Now if KDE 4 would bring back the functionality from KDE 3, everything would be fine. Especially "konsole" is still not usable in KDE 4. Device manager in KDE 4.4 will be even more useful. @Andreas. What KDE 3.5 features you are still missing from KDE 4.3? And what makes Konsole (it does not need "") worse? A big big loss for me from kde3 is the missing _meta info_ tab in the properties window in Konqueror. I have thousands of pictures that carried meta info and these are unavailable in kde4.3, neither in Konqueror or in Dolphin or in Gwenview. The files still have those info because I can see them in Gimp and through imagemagick also. I don't see myself copying and pasting thousands of snippets of text, some in Chinese, in the "Add Comment" field of Dolphin. It is a dramatic shortcoming for me. Aside of that personal misery, KDE4 is great and getting better and better.